The film features a wide variety of dysfunction: Ann’s alcoholic son Phillipe beats up a worker at the family construction business, her father is chronically suicidal, her brother Thomas (Mathieu Kassovitz) has remarried and is cheating on his new wife already, and the young daughter Eve (Fantine Harduin) from Thomas’ first marriage comes to live with the Laurent’s with her own baggage. Her mother seems to have been poisoned by Eve evidenced in a video she takes with her smart phone. Eve later becomes suicidal herself. Not only is the family recording each other but surveillance cameras scope out the estate. Anne plans to marry the family lawyer played by Toby Jones and her estranged son Franz shows up with refugees to the celebratory dinner. There is much screen time spent with smartphone text messages and email messages between Eve’s father and sadomasochistic lover. The overexposed cinematography of the film suggests a family with no secrets since everything is out in the open in broad daylight. On top of all of these problems in a family with vast financial resources Haneke sets their misfortune in a port town with a refugee camp. Haneke's use of the camp as a backdrop serves no other purpose than to demonstrate the inequity between a bourgeois family in a huge mansion, and refugees with no land or home. But reality pierces the unending misery of the Laurents since Annes son Franz is critical of the family he is born into and their sense of entitlement and brings some of the refugees home to dinner. 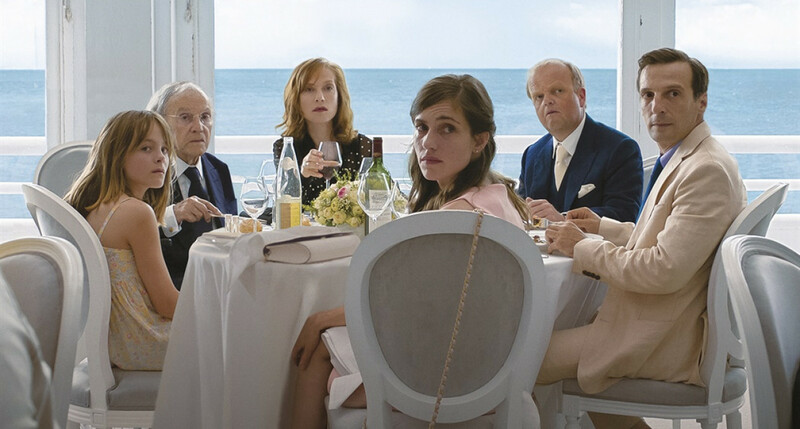 The title of the film reinforces the inability for the Laurent family to experience genuine happiness for each other or to win any sympathy from anyone looking on.